Most of us have experienced cold-weather skin woes—that uncomfortably dry, flaky, reddened skin that can be as predictable as the change in seasons. What you may not realise is that moisture-depleting heated indoor air is as much to blame as those low temperatures and cold, dry air swirling outside. Regardless of the cause, however, the question remains: How do you give your skin a beauty boost that calms redness, eliminates weather-beaten dullness, and prevents moisture loss—without changing your entire skincare routine? The easy answer is to outsmart cold weather by adding Moisture Renewal Oil Booster and/or Hyaluronic Acid Booster to your routine. These customer favourites reduce the appearance of rough-looking, extra-dry skin, strengthen skin so it’s better able to withstand moisture-depleting forces, and are even gentle enough for those prone to eczema. Often you’ll see recommendations to change out all of your skincare products in cold weather, switching to more emollient formulas. While that does work for some people, those with oily or combination skin can find rich products heavy and greasy-feeling; those with slightly dry skin can find them occlusive. So we recommend you keep the best core products for your skin type and concerns, and use boosters to seasonally customise your existing skincare routine. Our skin-hydrating boosters smooth away dryness, calm redness, and impart a dewy, supple radiance. Best of all, they’re perfect for sensitive, redness-prone skin—and gentle enough for skin prone to rosacea. Hyaluronic acid has the remarkable ability to hold 1,000 times its weight in moisture, allowing skin to retain long-lasting, desperately needed hydration. It also delivers antioxidants and hydration-holders like ceramides and cholesterol—both of which are naturally present in young, smooth skin. Hyaluronic acid also has calming properties, and works for all skin types, even if you’re prone to breakouts. Moisture Renewal Oil Booster contains a proprietary mix of skin-nourishing plant oils, skin-restoring antioxidants, and essential skin-boosting components, including gamma-linolenic acid, oleic acid, palmitic acid, and eicosenoic acid. Your skin is always hungry for these indispensable ingredients, but even more so when cold, dry air saps its moisture reserves. 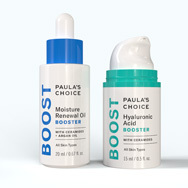 If you have dry, dehydrated skin, you may want to use both boosters morning and night. If you have normal to oily skin or combination skin, you may find the Hyaluronic Acid Booster works fine on its own, or that you prefer to use both products, but just once per day—or as spot treatments over dry, dull areas. There’s no exact rule to follow—just note how your skin responds, and adjust as needed. Regardless of your skin type, these two multi-benefit products will help boost hydration to get you through the cold, dry months with an unbelievably smooth, energised, radiant complexion.